We didn’t order a lot of food for this edition of Dot Com Pho because we had a cooking class with Chef Philippe Thomelin of Olivar Restaurant. The class was held at the Bargreen Ellingson test kitchen, which is only 10 minutes away from Pho Thanh Vi. Olivar Restaurant combines Chef Philippe’s deep roots from growing up in the Loire Valley of France, the influence of his Catalan grandmother and his love of all things Spanish to create dishes that reflect his philosophy of using the freshest, most seasonal seafood, meat and produce to create high quality food. 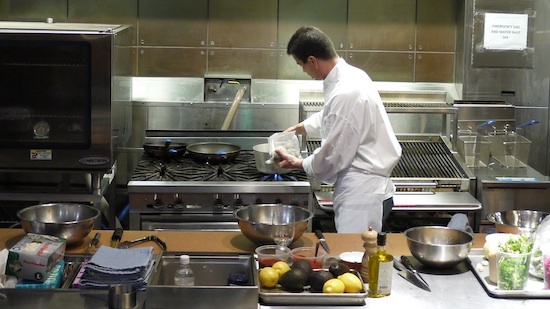 For our class, Chef Philippe showed us how to create two dishes featured at his restaurant. 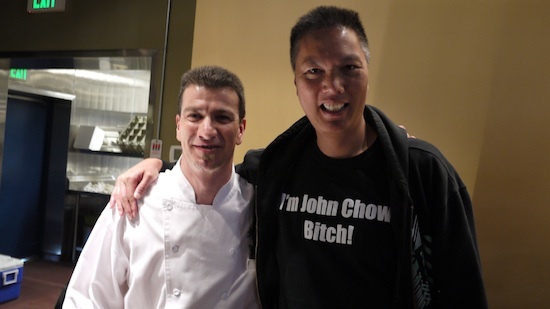 Like all fine dining chefs, he made it look easy and taste great. I get the feeling my results won’t be anywhere near as good when I try it. In addition to cooking like a chef, we tried a few new dishes at Thanh Vi and talked about the rapture that wasn’t. Bring a saucepan with 1 quart of water, the white wine, onion, carrot, bay leaf and clove to a boil and simmer for about 30 minutes. Let cool down. Clean the prawns, bring the stock to a boil, add the prawns and cook for about 4 minutes. Take out of the liquid and let it cool off in the fridge. For the dressing, combine the lemon zest, lemon juice, orange juice, shallot and garlic together. Wisk in the olive oil until it emulsifies. 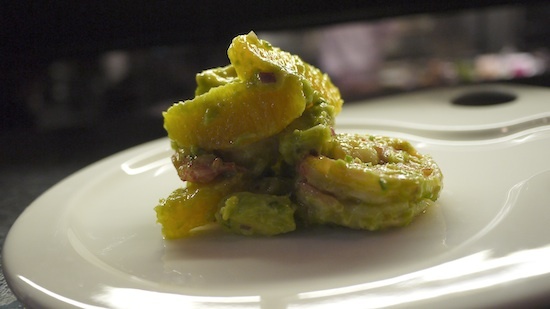 Slice the avocado and mix with prawns and oranges, season with salt and pepper and add the dressing. Mix all the ingredients with the ground meat together and roll into small balls, making sure the meat is packed tight. 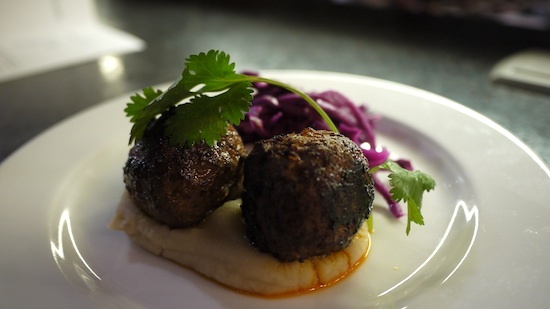 Cook in a frying pan in olive oil over medium heat, turning the meatballs often. Reduce the heat to low to finish to cook for about 10 to 15 minutes or until the meat is cooked.